As a genuine well-mannered host, we prepared a plan for your perfect day in Belgrade, allowing you to experience all the charms of this wonderful city. For all the visitors thinking about coming to Serbian capital, and for all those who have already packed their cases for arrival in Belgrade, web site noviapartmani.com is trying not only to provide the opportunity for booking affordable, comfortable and modern accommodation at superb locations, but also to provide useful information and advice, all of which will make your stay in Belgrade a memorable experience. The BLOG section regularly offers useful texts which should familiarize you with the most beautiful features of this city, sometimes even the hidden ones, and share our experiences with you. We’ve been writing a number of times about the locations and venues where you’ll definitely enjoy, surrounded by peace and quiet of the nature. Or perhaps you would like to spend the night partying in some of the numerous clubs in Belgrade. Considering the incoming summer days, the size of the city and plenty to see and do in Belgrade, we’ve made a tourist guide containing SIX SECTIONS which should facilitate getting around the city and planning of your time for a perfect day in Belgrade. The pre-condition for all of this is, of course, finding the adequate accommodation on time, and you can do this by searching through a huge offer of apartments in our web site, within the section apartments Belgrade. We are certain you won’t regret no matter which apartment you may choose, and the only question remains – do you want your “Belgrade base” to be in the city center, Vračar, Dorćol, or perhaps New Belgrade, to suit your business needs. In this last case, we recommend the following apartment Belvil Krin located in Belville area. You’re waking up fresh and relaxed in your apartment… After removing the blinds, the perfect summer day is right there waiting for you… Our recommendations is – take a light stroll to any of the Belgrade river banks and pick a nice and cozy river café where you’ll enjoy a fantastic espresso coffee and tasty breakfast – a great way to start a perfect day in Belgrade. In case the weather isn’t so perfect, don’t despair! Just go to some of the nearby cafés and we can guarantee you’ll enjoy a great espresso coffee and a fresh sandwich or Danish pastry. Having finished your breakfast and feeling all woken up, it’s time you started your Belgrade adventure. We suggest that you head to some of numerous cultural and historical venues where you’ll have the opportunity to gain first-hand experience of the turbulent and exciting past of our capital, and this part of the Europe, as well. There is lot to choose from, depending on your interests and preferences, and our suggestion is that you explore a number of buildings located in the very centre of Belgrade, which are the remnants of the historical turmoil which took place in Belgrade and Serbia. This exploration can be done on foot, by bicycle, or even by Segway, which is perhaps the most convenient way. You’ll not only save the energy for more challenges to come, but you’re also be accompanied by a professional tour guide who will present you some of the exciting facts relating to the most important buildings and historical venues in the city. 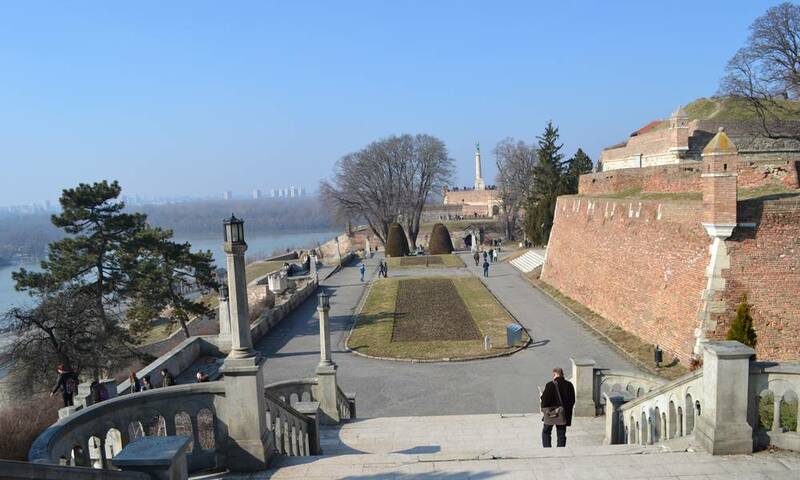 Probably the most captivating Segway tour is the exploration of Kalemegdan Fortress, during which you can also visit the Military Museum which offers a great variety of weapons used in this area from different periods of time. If you’re fond of “the greatest son of our nations and nationalities”, Josip Broz Tito, or you’re just interested in this highly important period of time undoubtedly marked by this historical figure, you’ll have the opportunity to visit the Museum of Yugoslav History, within which is also located the “House of Flowers” the burial place of Josip Broz Tito. Here you’ll be able to see some of the artifacts from the life of Tito, and also the thematic exhibitions which portray this period, so different than all the others. So, you’ve finished the exciting history lesson and learned something new. It’s time to treat yourself with the thing which makes this city one of the ideal City Break European destinations. It’s time for you to enjoy the culinary specialties and authentic taste of the Balkans. That’s why we’re suggesting that you head to some of the fantastic traditional restaurants located in Skadarlija, the authentic street and symbol of hedonism and XIX century social life of this part of the world. Whichever restaurant you may choose, you won’t regret. If you, however, prefer famous international cuisine, or you’d just like to taste some new flavours, you should go to Beton Hall right next to the Sava river, and your senses will be grateful forever. With these superb meals we would definitely recommend some of the great wines from this region, the famous Serbian brandy (rakija), or cold draft beer. After you had decent lunch and enjoyed the flavours of some of the most well-known Belgrade restaurants, it’s time you had some dessert. On your way back to your apartment, check out the candy shops and taste some of the authentic sweets of this region, which have been in this area ever since the Ottoman Empire, the well-known confectioners. Tulumbas, baklavas, tufahije, orasnice… you can choose whatever you like and be sure that you’ll be overwhelmed by the sweet, irresistible taste. If you’re not so fond of experimenting, the main pedestrian areas offer the traditional summer refreshments commonly found all around the world – the ice-cream. A busy day is coming to an end and it’s time you got ready for the famous Belgrade clubbing. Before you go out, we recommend that you relax in your apartment and recharge some much-needed energy for partying. If you’ve checked out the web site noviapartmani.com and selected an apartment from the section apartments with jacuzzi, this time of day will be even better when you submit yourself to relaxing waves of hydro-massage bathtub and you’ll feel fully revitalized and prepared for a whole night out. Don’t worry, you’ll have plenty of time to rest, as the real clubbing starts only around midnight. Depending on your taste and desires, you can visit some of the numerous city clubs and just enjoy the beats. No matter what your music taste may be, we recommend that you should definitely visit some of the places with traditional Balkans music and feel the specific rhythm and reckless partying. The night is long and if you don’t like it, you’ll be able to find something more appealing to you within minutes. The long night is slowly coming to an end and the swift Belgrade tempo is taking its toll. Now it’s time for you to go back to your apartment, your own oasis of peace and quiet and get some rest for the following day. Before you go home, however, we suggest that you visit the “last resort” of all Belgrade nightlife lovers - “the Avenue of Hunger”, Goce Delčeva street in New Belgrade – the place which offers all kinds of fast food restaurants, from all parts of the world, and for everyone’s taste. After a crazy night out, stroll along “the Avenue of Hunger“, grab some food and get ready for peaceful sleep. And tomorrow… if time is available, we’re sure you’ll carry on exploring this magical city and repeat most of these activities, and perhaps change them a bit, over and over again.